A Lagos trader, Emeka Nzube, has been remanded in prison custody by an Ikeja Magistrates’ Court, Lagos State, for allegedly stealing items worth about N5m at gunpoint. The 34-year-old suspect was arraigned on Friday on two counts of robbery before the Chief Magistrate, Mrs. T.O. Ojo. The police prosecutor, Sergeant Nomayo Kenrich, told the court that the defendant, a resident of Jakande, Lekki, and his accomplices, who are still at large, committed the offence on June 18, around 7.35pm in the Ojo area of the state. He was also said to have stolen his victim’s gold chain worth N1.2m, one Infinix Hot 5 cell phone, valued at N42,000, an Ipad worth N200,000 N1.5m cash, and N1.5m cash. Other items allegedly stolen by the suspects include one bag of rice valued at N13,500 and two laptops worth N300,000. “The accused, who pretended to be a policeman, blocked and robbed the complainant at gunpoint,” the prosecutor added. 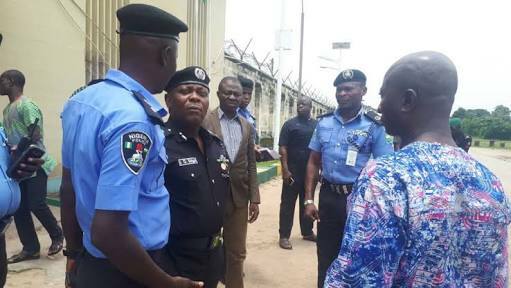 The offences, according to the police, contravene sections 297 (2) and 299 of the Criminal Law of Lagos State, 2015, the News Agency of Nigeria reports. The presiding magistrate, Ojo, ruled that the case file be forwarded to the Director of Public Prosecutions for legal advice while the defendant be remanded in prison custody pending the outcome of the DPP’s advice. The case was adjourned till September 4, 2018 for the report of DPP’s advice.